Anglo-Gallic. 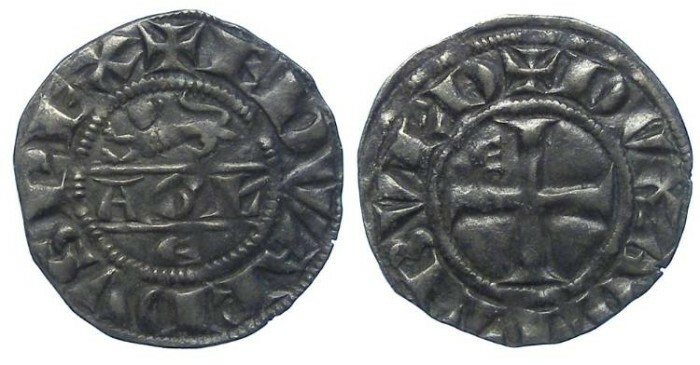 Edward I, AD 1272 to 1307. Billon Denier au Leopard. Denomination : Billon Denier au Leopard. Mint : Bordeaux. Date : 1st type. Issue of AD 1291 to 1294. Size : 17.1 x 17.6 mm. Weight : 0.96 grams. Grade : gVF with nice old collection toning. A very nice example of the type. Obverse : AGL across the field with a lion above and E below, with EDWARDVS REX around. Reverse : Cross pattee with an E in the first angle, with DVX AQVITBVRD around.